After Ahu Tahai we visited my favorite site, Ranu Raraku, the quarry where all Moai were carved. It was beyond incredible to see some of the 359 Moai that never left the hillside where they were created. Some were so large and heavy that they never made it out of the quarry! This is the largest, 71 feet, which turned out to be too large to move. There are partial carvings of other Moai flanking him. The statues were carved from the head down and subject to fracturing at the narrow neck. 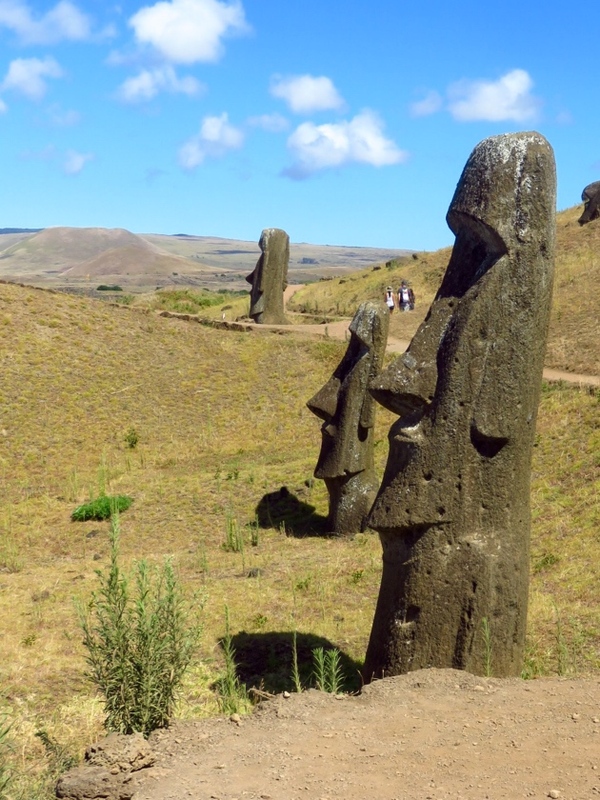 Another big mystery is how the islanders moved the Moai from the quarry. We could see on many statues a “keel” of sorts that was used to guide the huge forms down the hillside. What we see in most cases is only part of the 12-14 meter figures, usually from the neck up. Over time the bodies were buried in silt. We know there were earthquakes and tsunamis at several points in time. The style also varied. Earlier Moai were squat and more rounded, like my new friend here. Later ones were elongated, and the ears were also long. Here’s an unusual Moai, kneeling. It is at the base of the quarry, which you see in the background. The final site of the day was Tongariki, an altar with 15 Moai. This is a restored site, with the work headed by our lecturer Claudio Cristino. We had a slide presentation showing how the work was done. It reminded me of Xi’An in China. The Moai had been destroyed earlier and the pieces had been covered by the 1960 tsunami. The archeology team had early photos that helped guide the restoration, along with computer programs. The thousands of pieces were numbered and painstakingly glued together. The long altar was an impressive site, for sure. Anyone want to guess what this structure is? It’s made of lava rock and has no visible openings. It’s a chicken coop! How do you enter? Only the owner knew where the entrance stone was. After all the touring, we headed to the lovely Anakena beach for a barbecue with multiple stations of hot and cold food. And of course, entertainment and wine! There was an afternoon option to visit more remote altar sites, but almost everyone was Moai’d out and went back to the hotel to enjoy the lovely pool. Don ordered us these fancy drinks! And that’s more than enough for this post! Still more to come from this stop on our trip. Your pictures are my pictures, including the one of you standing on that bridge like thing near the Moai. Glad you had time to rest!! I should have sent you all my pictures so you could have taken it easy! Marlenethese posts are fantastic. The pictures are beautiful and I feel like I’m riding right along with you with all the information. You’re saving me tens of thousands of dollars! (As if!!). Seriously, though, at the risk of sounding trite, thank you so much for sharing! Wonderful, as usual. I love reading your posts. Thanks, Debby! Hope to see you soon, either in Boston or Hudson! Yes, it was, Char. A true labor of love.